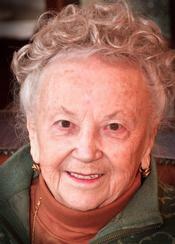 Margaret Elisabeth Tomaschek (nee Kiss) age 89, passed away on January 2nd, 2013 after a long illness. She was born on January 10th, 1923 in Nagybarat, Hungary. Daughter of the late Reverend Samu Kiss and Margit Gecsanyi. Beloved wife of Laszlo for over 63 years, loving mother of Dr. Ildiko Kondray (Dr. Gregory Kondray) and Dr. Laszlo Tomaschek (Suzanne Gereby). Dearest grandmother of Greg, Kristof, Marton, Viktor, Laszlo (Veronica), Attila, Endre, and Istvan. Great grandmother of Isabella and baby Lucia. Cherished sister of the late Magdus Giczy and the late Reverend Jeno Kiss. Loving aunt of many nieces and nephews both in Hungary and in the United States and Canada. A Memorial Funeral Service will be at 11 am on Saturday, January 12th at the West Side Hungarian Lutheran Church, 3245 West 98th Street, Cleveland, Ohio 44102. Inurnment Sunset Memorial. Donations may be made in her memory to the West Side Hungarian Lutheran Church. Lacikám ma tudtam meg, hogy Édesanyádat a Jóisten magához hivta. Öszinte részvételemet küldöm neked és családodnak. Az örök világosság fényeskedjék neki és kérem a Jóistent, hogy vigasztalon benneteket e nehez idökben. Szeretettel ölel!